The federal government Imperium of Diamond's own ability to achieve an economical stage their own civilization to the level of the economy and modernization in the ratio of sufficient force that is capable useful for actually paid on all financial debt of any country in the entire world. The federal government Imperium of Diamond's why around year’s since 2005, is preparing Common possibilities of our cooperation which mean’s business strategy activities for the payment of any debt of the government and thus make a common agreement on a common trade market, cooperation for development, shift’s patent right’s and copyright’s or example, another form of cooperation between our corporation. 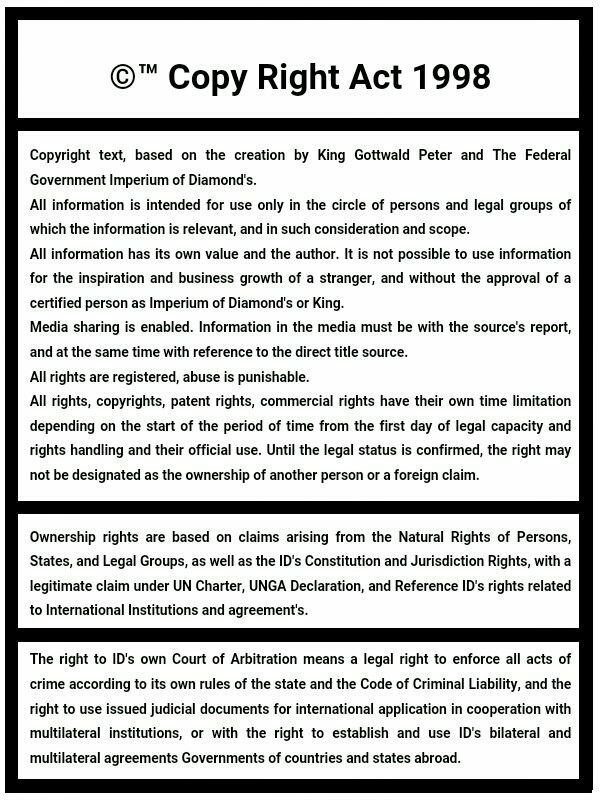 The federal government Imperium of Diamond's therefore essential for a special business subject to legal value as a corporation with autonomy from the government and the liability of it’s own name. Therefore, they may be based agreement on the right’s of the Imperium of Diamond's of Commerce Corporation, the opportunity to participate in the strategy pay a financial debt of Your country's government, in which case it becomes possible to offer strategic step for our organized cooperation where possible and capabilities Imperium of Diamond's, to ensure financial stability Government’s of countries all around the world. Instant Payout, by coins, with an area of ​​monetary strategy session. The redemption of all bonds and to ensure common agreements without stress factor. The development of civilization or market level sufficient to pay the debt. Cooperation to fund the Imperium of Diamond's and the ability of instant payments. Developing strategic position and the legal form of monopoly on the global market cooperation. The federal government Imperium of Diamond's in this case is the ability to pay all your debt’s, or indebtedness of any government countries and worldwide. In this case it mean’s that the federal government Imperium of Diamond's will own enforceable right to choose Your debt and thus ensure payment again from your side, however, but through a much more simple and easy to Term’s and Condition’s of which are not stressful economic development activities of your civilization, and thus without damaging stability your economy. Minimum interest rates and the possibility of immediate payment of the debt through cooperation in a multi estates. Repayment’s of debt through the issuance of Check as independent curency for the possibility of free purchase of raw material’s from the market in your country. The federal government Imperium of Diamond's in such a case requires the creation of a common agreement about the value of the custom pay to the board’s outside of your country. The system of common market which may be based on a format re-organized-trade and offshore-constructing of material’s with the ability to create a legal form of Legal monopolies and ensure the payment of all the debt through automated cycle of civilization economic’s and strategy planning of common trade cooperation or create of Internal development in Your economical territory. Possibility to provide rules on commercial activities on the territory of your country, according to a jointly agreed project business corporation’s, with a profit. Allowing for the Imperium of Diamond's to establish a business activity from your home country while gaining a position of international business strategy is the ability to settle debt’s with a profit. Debt and it’s payment by developing a common strategy for development cooperation on the territory of the Imperium of Diamond’s, the activity of the corporation and the market, the currency strengthened as financial curency Imperium of Diamond's and also an opportunity to ensure a sufficient level of development in the debt ratio values. Special strategies of mutual fund’s. Other option’s common of strategy. For net international debt by country (external debt owing to other countries minus external debt of other countries held), see Net international investment position. This is a list of countries by external debt, the total public and private debt owed to nonresidents repayable in internationally accepted currencies, goods, or services, where the public debt is the money or credit owed by any level of government, from central to local, and the private debt the money or credit owed by private households or private corporations based in the country under consideration. This is not to be confused with public debts which can be found under "List of countries by public debt". Note that while a country may have a relatively large external debt (either in absolute or per capita terms), it could be a "net international creditor" if its external debt is less than the total of the external debt of other countries held by it. For example, Norway, Hong Kong, Switzerland, Japan among others are net international creditors. — Faroe Islands 888,800,000 2010 est. 184 Nauru 33,300,000 2004 est. 186 Niue 418,000 2002 est. The federal government Imperium of Diamond's trying to create a strategy, which mean’s the ability to pay all money for debt’s of every government countries and worldwide. Imperium of Diamond's economy and diplomacy of government is able to achieve success in the ratio of actual payment of all financial debt for each country's government from around the world, and soon immediately in several week’s. Today is the fact that the federal government Imperium of Diamond's ability to pay is not just one single debt. Debt that actually own’s a state of the European country, financial debt that is secret concealment in the media, and blocking of knowledge in society or among trader’s. Financial debt has been formed by the terrorist activities of European countries' government’s and their strategy of international crime. The value of European debt rapidly exceed’s the economic value of the planet Earth. The federal government Imperium of Diamond every day is blocked by the European terrorism. Terrorism causes that other government’s of countries around the world not can use my bid’s for our cooperation in order to remove financial debt of the government, and therefore it mean’s that in the future could any government land to apply for all the principles of financial compensation of losses to cooperate with the federal government Imperium of Diamond's. Therefore, European government’s the country through their terrorist won only one single ability to borrow own country again even more and also provoke the world. This is a list of countries by public debt to GDP ratio as listed by Eurostat for the EU and by CIA's World Factbook 2012 for the rest of the world. It is the cumulative total of allgovernment borrowings less repayments that are denominated in a country's home currency. This is a list of countries by estimated future gross central government debt based on data released in April 2015 by the International Monetary Fund, with figures in percentage of national GDP. In the First case of cooperation is neccessary commonly start anti cooperation against European Terrorist Organization and therefore prevent against terrorism. =According incident, one of many else.